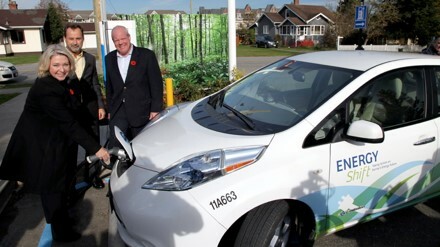 The City of Surrey knows EVs are the future of transportation. This commitment was addressed through their 2008 Sustainability Charter and 2010 Corporate Emissions Action Plan. In 2011, Surrey became the first major city in Canada to host a publicly accessible EVSE. They also began piloting a Nissan Leaf that same year. It would be a few more years before EVs were added to the fleet. In making the decision to go electric, the city worked with FleetCarma, a division of CrossChasm Tehnology, to assess whether gasoline vehicles were candidates for switching to electric. With this information in hand, the city decided to remove 12 vehicles in their general fleet and replaced them with 5 Nissan Leafs. This transition was also aided by collaborating with Modo, a local car-share co-op. Utilizing the software and hardware that Modo had developed, the city was able to reduce the operational and logistical complexity with the rollout of their EVs and their ongoing management. In the initial assessment, EV usage was critical in the return on investment (ROI). It was determined that the EVs would need to be driven 60-80km per day, and this would provide an ROI of 5-6 years. This aspect of the rollout has been a success. The city also surveyed employees who utilized the EVs and were pleased to see that 96% preferred the EVs over gasoline vehicles. Next steps for the city include replacing more fleet vehicles with EVs, and FleetCarma has already identified 3 additional candidates.